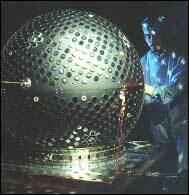 Several small, optically reflective spherical "STARSHINE" student satellites, built by the U.S. Naval Research Laboratory, are being deployed by NASA from Hitchhiker canisters in Space Shuttle cargo bays, as well as from an Athena unmanned launch vehicle, into highly inclined low earth orbits at a rate of once every year or so. The satellites are covered by nearly 1000 small, front-surface aluminum mirrors that are machined by technology students in Utah and polished by tens of thousands of students all over the world. We have a several pages about our participation in this project in Russian. And this is only small story about it. We were registred and recieved our polishe pack for Starshine-3 mirrors in early March 2001. And only after 3 days hardly work our pair mirrors N262 looked perfect! We had all the students and teachers (who worked on our mirrors) sign their names in special paper form, and mailed whole package (best mirror, optical flat and paper form) back to Project Starshine, (Aerospace Development Center, Jacksonville State University). While our mirror was on its way to US, Oxygen in the air was react with its polished surface and formed a thin film of Aluminum Oxide, which is a poor reflector. Therefore, optical engineers from the Optonics and Photonics Laboratory at Hill Air Force Base (Utah) ultrasonically cleaned it. And then put it in a vacuum chamber and covered up mirror surface by vaporizing a mono-molecular layer of fresh Aluminum over the top of it. Then they were deposit a half-wave-thick layer of Silicon Dioxide on top of the fresh Aluminum and seal the surface to prevent further oxidation and protect it from scratching. All coated mirrors finally collected at the Naval Research Laboratory in Washington, DC. Engineers there, who built Starshine satellite, mounted mirrors all over its outside surface and secure the CD-ROM with student and teacher names on it to a deck inside the satellite. 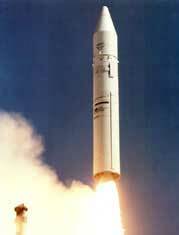 Starshine 3 Last news: The unmanned Lockheed Martin Athena-I lifted off from the Kodiak Launch Complex, Alaska, at 02:40 GMT on September 30, 2001. Deployment of Starshine 3 into a circular orbit at an altitude of 300 statute miles and an inclination of 67 degrees was done above the south Pacific Ocean two hours and 9 minutes after launch... Now we are preparing for our Starshine 3 observations.